Reading young-earth creationist’ literature can be a very confusing experience. Because they employ so many ad-hoc explanations to tackle specific problems it is not uncommon to find articles that contradict one another. Sometimes those articles are written by the same author (see: The Dangers of Poor Scholarship). One of the most common mixed-messages can be observed when young-earth authors discuss the amazing adaptations of a species to its environment. One author lauds the adaptations as being so specialized that it isn’t possible that these characteristics could have produced by any natural process and thus must have part of that species as it was originally created. Another author recognizing that the particular species didn’t exist at creation but rather diversified from a common ancestor that departed from Noah’s ark will propose what sounds like a naturalistic explanation for the origin of the same features. Because they must eat almost continually to keep their energy up, otters can’t stop hunting when the sun goes down. So God equipped them with “night vision goggles”—reflective crystals at the back of their eyes. These crystals allow the eye to gather more light when the water is murky. Such a brilliant design would have helped them harvest plant food even before the Fall. Despite the curse, we can still see hints of God’s original designs for the lowly seaweed and the furry sea otter—the caretaker of His underwater sea forests. The author clearly believes – he mentions that even before the Fall they had this design – that the sea otters were created much as we see them today with many special characteristics allowing for them to live nearly their entire lives in the sea. What then are we to think when we enter the Ark Encounter and discover that sea otters “evolved” from a pair of land-loving common ancestors on Noah’s Ark rather than having been part of the original creation? Answers in Genesis has published numerous articles about how the “kinds” that were on the ark have diversified greatly to fill the present world. In the article “Mammalian Ark Kinds” by Jean Lightner, the sea otter species is considered to be just one of 59 living species of animals we recognize today as weasels, badgers (including those crazy honey badgers), otters, martens, ferrets, minks, stoats, and wolverines. The Ark Encounter argues that all of these diverse species were represented by just a single pair of animals on the Ark which then hyper-speciated into all of this diversity we have today including the sea otters. What are we to make of the special features of sea otters that one author tells us are so amazing they must have been created in this species even before the Fall when the Ark Encounter portrays a pair of animals on the Ark that were not sea otters but some kind of land animal and the sea otters then adapted to living in the sea within the past 4000 years? The rescuing device that AiG has used in the past to escape from this mixed message is to propose that God endowed all the genetic variation necessary to form all these amazing adaptations to specific environments in the original members of the “kind” at creation. In the case of the sea otters, the genetic capacity for producing all the specialized characteristics which makes them capable of living in the sea when none of their other relatives can was pre-coded and somehow maintained in the ancestor brought on the ark and then sorted out from the variation that made honey badgers, minks, weasels and other land-otters leaving only the sea otters with their unique characteristics. How did this sorting occur? Apparently some form of natural selection and genetic drift albeit at rates faster than anything measurable today. Despite this hypothetical explanation for how God could have pre-created specialized characteristics that would appear thousands of years later, the first author clearly portrays the sea otter as a special creation endowed with its characteristics from the very beginning. 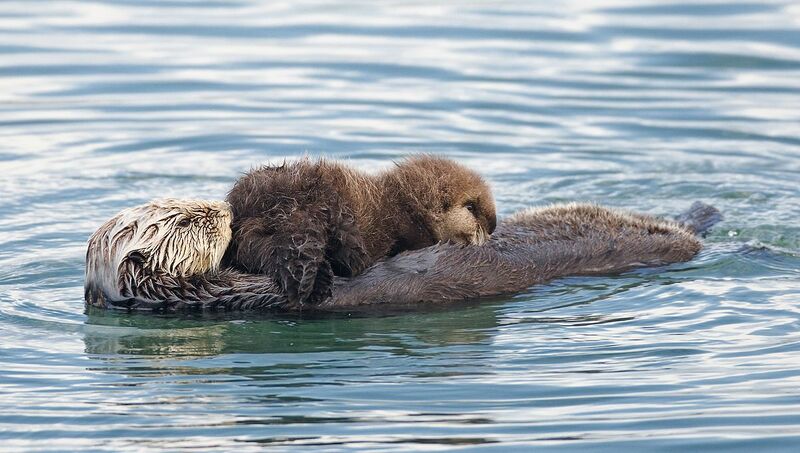 He treats the sea otter as a “kind” in itself. As such I think he does just what is natural and just how the biblical authors would have understood living things. They associated animals that we generally call species as kinds which produced “after their kind” meaning they had offspring that looked like themselves. Sea otters give rise to more sea otters, not to honey badgers. Sea otters on the Ark? You might wonder, if sea otters can live on the open ocean – even giving birth on the seas – why then would they have had to have been preserved on the Ark? After all, they really aren’t an air-breathing land animal. The Ark Encounter tells its audience that whales didn’t have to be on the ark because they live in the sea. I’m not sure what they think of seals and walruses. So, maybe the first author could be right. The sea otter could be its own kind and he could then argue that it could have survived the Flood outside the ark. The problem with this is that genetic studies clearly show that sea otters are closely related to one particular group of land otters. They are as similar to other otters and to weasels as an African wild dog is to other canines. This is partly why AiG wants to put them into the same “kind” with other otters despite their unique and amazing adaptations. They are convinced that they are “related” to other otters despite their unique features. So they prefer to explain the origin of sea otter not as a special creation adapted for life as it lives from the very beginning but rather as the descendant of a land animal that has, over time, become exquisitely adapted to living in the sea through natural selection, genetic drift and even mutations. I think you probably know what that sounds a lot like to me. « Ken Ham’s Ark Encounter to Usher in a Modern Day Reformation? It may have been mentioned here previously, but to me the post-Flood Hyperspeciation (PFHS) theory opens up all design claims in past, present and future AiG materials to the question of whether they are the result of direct creation or PFHS. Does AiG have any material suggesting which species (?) have remained stable since creation and those that have apparently arisen post-flood? How does AiG compare with other creation ministries on this issue? Great questions! there is hardly enough consistency in their work and other organizations to be able to draw many conclusions. The design argument is so intuitive to their audience that they can’t help but use it leading the audience with the impression they believe that God created animals just the way they are. But then they also want to say that animals have changed. I have never seen a set of criteria laid out that they could use to determine when a trait is original design or design via change over time. CMI and ICR have the same problem as AIG. They use both design arguments when they are convenient or necessary. I think of something like teeth. In AiG seminars they go to great length to show that sharp teeth in carnivores could have originally been used to eat plants. So they are implying that the teeth have not changed but obviously teeth have changed a lot in the PFHS – like the acronym – since some cats had saberteeth and other didn’t. The pair on the ark couldn’t have had every kind of tooth expressed. In the PFHS they could just say that the teeth changed due to selection on pre-created genetic variations that allowed the expression of sharp teeth that weren’t expressed in the original cats. So mostly they can just bounce back and forth when it is convenient but it starts to look silly when you argue that characters are so complex they could not have resulted from any natural process and yet in the PFHS these characters are clearly not the result of fiat creation. Oh, one more thing. I think this is one area where you can see a difference between ID/OEC and YECs. OECs don’t believe in PFHS and see discontinuity between species and so really they do see design as original to each species. In this way the YECs are far more akin to evolutionary creationists than they are to OECs. I think there’s a comparison to be drawn between modern YEC and ID, as well. YECs are now openly affirming a “compartmentalized” evolution, but adding the caveat that God provided the “information” for the evolution to occur by aggressively frontloading the original genomes. ID proponents affirm general, non-compartmentalized evolution, but also insist that God was providing new information along the way to enable each evolutionary change. Hmm, methinks we need a infographic comparing the various models. They associated animals that we generally call species as kinds which produced “after their kind” meaning they had offspring that looked like themselves. come in to you, to keep them alive. Thanks for the correction. I quite agree. I wrote that too quickly and without enough thought into the broader context. Yeah, I suspect it is a general statement about types of animals rather than any reference to species or “baramins” or anything like that at all. Well, YECs invented the whole concept of “baramins” to account for the limited space on Noah’s Ark and to accommodate mounting evidence of speciation. It’s not exactly biblical. The hebrew “min” (מִין) really does mean species, not family or such. Leviticus 11:14 uses it calling falcons and kites separate “kinds”. The following verse calls ravens a distinct “kind”. There are many more. There is no evidence in the bible that these kinds are large groups, and much evidence that they are narrow groups (species). Although I agree the YEC have a problem with inconsistency here, due to them also claiming that all canines are related. But I disagree with the claim that these similarities (either genetic or morphological) “clearly show” that these species are related. Similarities make perfect sense from a design perspective, you wouldn’t expect every single species God created to be equally distinct from one another, would you? It just does not follow from “these creatures are more similar to eachother than anything else” that “these creatures share a common ancestor”. That is only the conclusion if you assume macroevolution is true from the start, not a natural inference from the data alone. Kinda illustrates one of my problems with it, so much of the research claimed to support macroevolution doesn’t really follow from the data. It is really only “consistent” with macroevolution, but is equally consistent with a design model. It doesn’t really support it, it just can be explained from that perspective.